Home > Ask Our Experts > White Lumps From Throat in Mouth: What Are They? Almost every day I keep getting little white nugget type balls apearing in my mouth. I think they're coming up from my throat. They feel quite firm but when you squeeze them, they smell really bad! I'm not in any pain I feel 100% - not ill at all. What are they? How do I get rid of them as I feel they might be giving me bad breath? You sound as though you have developed a condition that is known as tonsil stones, or tonsilloliths. These don’t occur in everyone, but they are relatively common and they don’t make you feel ill. However, you are right in thinking that they are probably the cause of your bad breath. Tonsil stones are collections of debris – food, mucus and bacteria – that collect in the pockets of the palatal tonsils at the back of the throat. They arise because food does not get cleared effectively from these pockets, and it starts to decay (that is why the balls smell so bad). Bacteria start to grow and once the balls reach a certain size, they tend to come off. They can also form on the roof of your mouth and they can be different sizes. Small ones are only a couple of millimetres across, but large ones can be up to a centimetre in diameter They break off easily and you either swallow them, or they come into your mouth. Sometimes, the tonsil stones can become quite hard – the trapped gunge starts to calcify and harden and then they can’t be removed from the tonsils quite so easily. Do you find you get sore throats or tonsillitis? 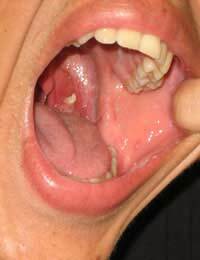 Sometimes a tendency to get tonsil stones can lead to more frequent tonsillitis. Tonsil stones can be treated – if your tonsil stones are quite soft and come off easily, it may be a simple matter of using a mouth wash a couple of times a day, cleaning the inside of your mouth with your toothbrush and perhaps chewing on a dry cracker now and again to rub away the tonsil stones. You can use a bought mouthwash, or use a salt solution (don’t swallow it!). If that does not help, probably the best thing to do is visit your GP and explain the problem. If the tonsil stones are leading to regular tonsillitis, one option is to have an operation to remove your tonsils. However, this is a drastic step and only your doctor can advise you whether it is necessary. I use too much oral jel after that i feel white small patches and on one side small white bump which not heal.. In my mouth .Left side a big throat .I go for solution . Doctor..But doctor do my some check .Then doctor say this is a big tonsils..U have do opration for this throat ...What I do sir give me some advice...Plz sir . We cannot give personal mediacal advise, you would have to visit your GP for an examination and assessment. I have had a lump in my throat on the right side for about 3 weeks, it's visable and not painful but quite irritating. Any idea what it might be? Sir , I have rising a white lump in my throat on tonsil I think this is tonsil stone but i worried about this stone its not much painful little bit painful. Is this dangerous? What can i do? My daughter had a sore throat that has been treated and gone but has left a visible swelling in her throat, the doctor says we shouldn't worry about it but we are not satisfied and worried as it looks like a lump and hasn't gone down for over 5days. I have been getting these tonsil stones quite a few times now and it's always before a really bad throat infection. I've never had any lose of bloody but I've woke up in my sleep tonight with flem in my mouth with very red blood and in the blood is the tonsil stones. Am quite worried is there anything I can do to help it till I can try get in the doctors tomorrow morning? I have found a white lump in the back of my throat doesn't hurt but been feeling more tired than normal andgot a very sore Throat. What could it be. Hi My spouseis facing some problem in her throat.From quite few daysshe brought up blood while she up bloodin her mouth wash in the morning. We have consulted our doctor. The doctor said everything is normal . We are not satisfied , pls suggest any other doctor. my throat had an irritation only on the right sidewhile drinking alcoholor eating spice food or drinking milk for last 5 years continuosly. i am a 21 years old male. what is the reason?some times it will be curable..even a tea can cause this problem. I had a sore throat for a couple days and then it went away. I discovered I had bumps on the floor under my tongue. Also, there is redness near my throat and I have recently discovered that there are two medium-sized pimple-like white bumps on both sides of my tongue. My throat feels like it is blocked and I can feel the roughness as I swallow. As to what I described, do you know what condition I have? Is there something going on what my throat that is totally unrelated to the bumps underneath my tongue?